I’ve been wanting for a little while now to repeat a post I did early in the life of this blog. In fact, it was the third post I wrote here (not including the “Hello world!” introductory post), two years ago less a week, on January 13, 2008. It concerned a subject that my mom had recently (at the time) discovered in a library book she was reading, though I seem to have neglected the name of the book. We all know that you can count the rings of a tree’s trunk, once it’s been felled, to figure out the age it was when it died. You can also do the same thing for large branches by taking a cross-section. But did you know you can also observe the passage of years on the twigs at the end of the tree’s branches? 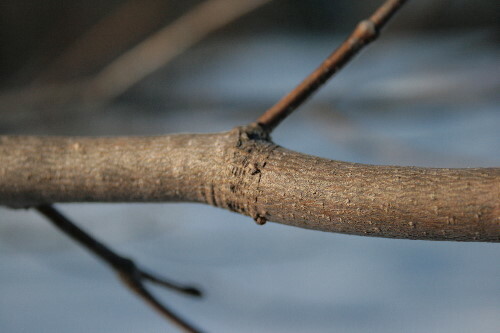 As a twig grows, its extension of length follows the same stop-and-start pattern as the rings in the tree’s trunk (which represent the laying down of new wood each year), since obviously they don’t continue growing in the winter months. At the end of the fall, before the twigs stop growing for the year, trees such as this maple develop flower buds at their tips that will turn into next year’s flowers come spring. 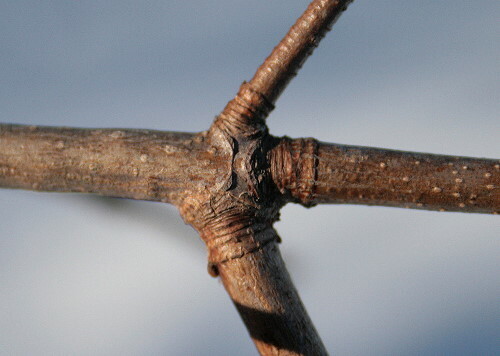 Where they set their buds (regardless of whether or not the twig develops side branches) the bark of the twig “wrinkles”. You can’t see it at the point of the flower buds, but you can easily detect it for previous years. Look closely at the two photos above. See how there’s spots along the twig, about the same length as the twig is wide, where there appear to be a whole bunch of ridged rings clustered together? You can also see it at the base of the side branches on the top photo. That’s where the buds formed that year. Once the flower buds have finished and the tree has released its seeds, the twig continues growing (at least, I believe this is how it works; I poked about online to confirm, but couldn’t find anything that mentioned it. 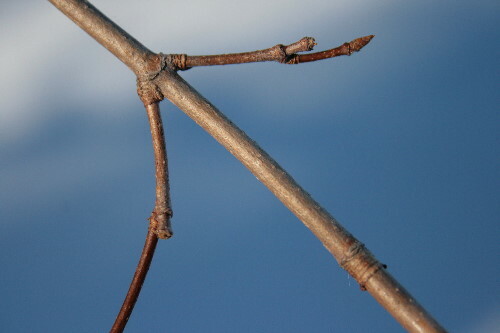 It would be hard for the twig to grow while bearing flowers at its tip, though). The rings persist many years. This is from much farther back on the branch; you can compare the thickness of it to the twig that’s coming off the side. The rings are still present, but you can see the ridges of the bark just starting to cross through them. 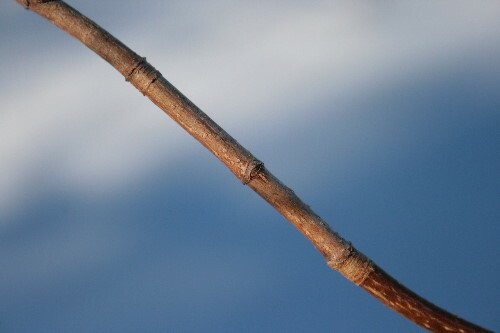 Because they’re a long-lasting physical feature, you can count backwards to examine the annual growth of each twig and branch. Here’s a sample, above. On this small twig I found four sets of rings, set at various intervals along its length. Each ring represents the start of a new year’s growth, with the portion of twig between each ring having grown in that particular year. 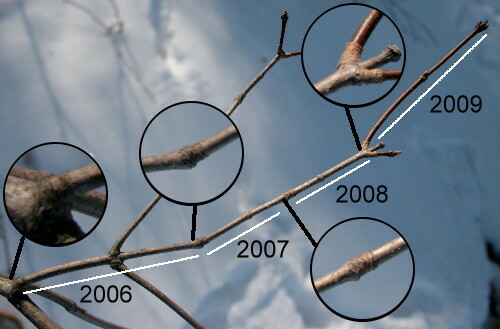 So if we consider the small flower buds at the end of the tip as 2010’s new growth, then the section of twig just below the flower bud was what the tree produced during 2009, back as far as the first set of rings. The bit of twig between the first and second set of rings was the growth from 2008, and so on. Incidentally, data from the University of Waterloo about an hour and a half west of Toronto indicates that rainfall was about average in 2009, above average in 2008 and 2006, and below average in 2007. Doesn’t really help explain the growth pattern, does it? that I feel so smart! Thanks, KaHolly! I like to pretend I know lots, but quite often I learn the stuff only a short while before you do! One of the things I love about blogging is how much I discover. Very interesting. Once again you have given me new information and something to look for on my own walks. Thanks. Thanks, Cheryl! I love these little things that are easy to look for when out walking but so fascinating to observe. Very interesting! I hope you’ll submit this to the next Festival of the Trees. Thanks, Dave! I should do that right now while it’s on my mind! I hadn’t known about that. I’ll have to look for growth rings on the trees around here. It’s pretty neat to be able to examine a branch and sort of feel like you’re looking back into its past the same way counting tree trunk rings feels like you’re seeing the history of the tree. Quite educational. I didn’t know this, but now it’s something I’ll be looking for each time I see a branch. I found it pretty neat when I first learned about it. I have this idea that this year I’d like to tie a piece of thread or something to a few twigs where their flower buds were and then check on them throughout the season to watch them grow. Wicked! I remember learning about this back in my school days, why I forgot something this awesome eludes me….so thanks for bringing it back to my attention! I’m amazed at some of the cool stuff I learned in school but have since forgotten. I think part of the problem, Emilie, is that it was learned in school! The stuff I’ve learned on my own since then, because I was interested enough to search out the answer, has stuck with me a lot better. Not a library book, one I own. It’s A Naturalist’s Guide to Forest Plants: An Ecology for Eastern North America, by Donald D. Cox. There’s other good stuff. You can borrow it, if you like. How cool! Thanks for the tip. I love looking very closely at trees and the secrets they tell. This is great information & really useful to me. You have a fantastic blogroll & if this post is anything to go by, there is a lot I can learn from your blog. I will visit often. I found you via FoTT’s. Thanks for that… interesting & useful! came via fott, but will be back!